Promoted by M/s Gujarat Agro Infrastructure Mega Food Park Pvt. Ltd the Park is located at Village Shah and Vasravi, Taluka Mangrol, District Surat. A 2nd Mega Food Park has been sanctioned by the Ministry in Mehsana District of Gujarat. 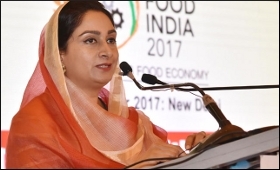 Harsimrat Kaur Badal, inaugurated the Park in the presence of Sadhvi Niranjan Jyoti, Minister of State for Food Processing Industries, Vijay Rupani, Chief Minister of Gujarat, and Smt. Darshana Vikram Jardosh, Member of Parliament, Lok Sabha, Surat. Speaking on the occasion, Smt. Badal said that the Mega Food Park will leverage an additional investment of about Rs. 250 crores in 25-30 food processing units in the park and generate a turnover of about Rs. 450-500 crore annually. The Park will also provide direct and indirect employment to 5,000 persons and benefit about 25,000 farmers in the CPC and PPC catchment areas. Aimed at giving a major boost to the food processing sector by adding value and reducing food wastage at each stage of the supply chain with particular focus on perishables, Ministry of Food Processing Industries is implementing Mega Food Park Scheme in the country.